by Grant, Heath; Terry, Karen J. For courses in Introduction to Law Enforcement. A current and practical look at policing practices from a big-picture perspective. 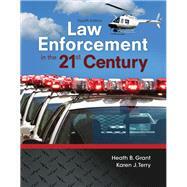 Law Enforcement in the 21st Century keeps readers up-to-date in this ever-evolving field providing a synthesis of the latest research literature with practical insights from the field. The important theme of linkage blindness is a central theme throughout, highlighting the multi-jurisdictional complexities of policing in the United States and abroad. Linkage blindness is then used as an important pedagogical tool to frame realistic critical-thinking exercises. The Fourth Edition reflects the many challenges that have faced policing in the recent months and years. New chapter introductions — drawn from contemporary issues related to the use of force, community relations, and gun control — update the text for the current classroom. New concepts are added to the discussion, including student appreciation for the importance of police legitimacy. Greater attention is also paid to new technologies being piloted across the United States. Dr. Heath Grant, formerly the Research Director at the Police Executive Research Forum, has more than twenty years of experience offering training and technical assistance to law enforcement agencies internationally. This includes his recent work with the Bangladesh National Police. He has also helped to develop effective prevention programs internationally for USAID and other organizations. Dr. Karen Terry is an internationally known expert in sexual offending, including the practical law enforcement responses to the challenges of this difficult type of offense. Most recently, she served as the PI on a major study commissioned by the Catholic Church to document patterns in sexual offending by Catholic clergy, as well as the relationship between offending and both situational and policy dynamics.